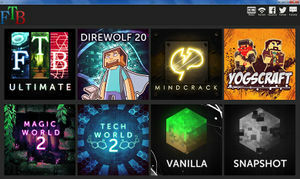 The Feed The Beast Launcher is a launcher program, which presents users with a window to select accounts and settings, like the official Minecraft launcher. In addition, the user is also able to select modpacks, maps and texture packs to enhance the game experience. In addition to being able to use the prebuilt modpacks, the launcher also offers users the ability to easily customize modpacks, through the modpack editing dialog, which can be opened by pressing the "Edit Mod Pack" button at the top of the Modpacks tab. The Launcher is available from the Feed The Beast website, the current version is v1.4.3. Aside from the binary distribution, the source code for the launcher is available in a GitHub repository. On May 27th 2013, the Feed The Beast team announced in a forum post that they are developing version 2 of the launcher, which will completely overhaul the user interface. The release of this launcher was intended to coincide with the release of the modpacks for Minecraft version 1.6, but has been delayed until they fix some critical bugs. This page was last modified on 2 April 2015, at 15:57.